Here's a real blast from the past: a complete local newscast from the 1960s, including commercials. It's a prime example of how television can be a time capsule unlike any other, and it also shows us how far local news has fallen over the years. *Prior to then, it was common for local newscasts to consist of three distinct programs: news, weather and sports, each with their own sponsors. 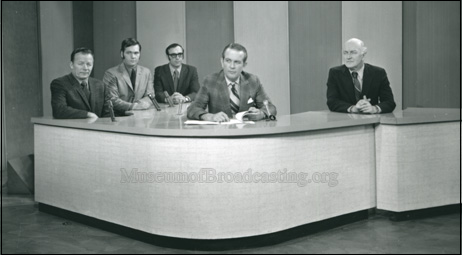 The on-air personalities would share a single chair behind the desk; after the commercial marking the end of the news, the weatherman would appear with his maps and charts, and would then disappear after the next commercial block, to be replaced by the sportscaster. This broadcast, from January 17, 1968, appears less than three weeks from the show's debut. The lead story: President Johnson's State of the Union address. As for the stories themselves, they represent a moment frozen in time from the tumultuous year that was 1968. Lyndon Johnson is still a candidate for reelection, Robert F. Kennedy is still alive but not yet a candidate, Eugene McCarthy is a candidate but not yet taken seriously. There's a group looking to impeach LBJ; I don't remember anything about them, but obviously they didn't get very far. Martin Luther King Jr. was still alive, Vietnam was still trouble, the crew of the Pueblo had yet to be captured. Watching the news, I had the impression we were looking at the calm before the storm. The weather is blissfully streamlined; without radar, there's no ability to show fronts moving in, to recap the last 24 hours, to project the next 12, to show what the weather's like in other parts of the country. All we're interested in is the weather in the five-state area, in Minnesota, and in the Twin Cities. I loved Bud Kraehling's "just the facts" type of forecast, and his ongoing banter with Moore, which never seemed scripted, was a delight for years. George Rice, the station's editorial commentator, is there for his nightly commentary, something you don't see all that often on local news anymore. Commentary was a real flashpoint in the '60s and early '70s; conservatives often accused national newsmen of presenting unlabeled commentary under the guise of reporting, and the "instant commentary" provided after such events as the State of the Union were a sore spot with many viewers, who resented talking heads telling them what it was they'd just seen and heard. It was important, therefore, that commentary be labeled exactly for what it was. 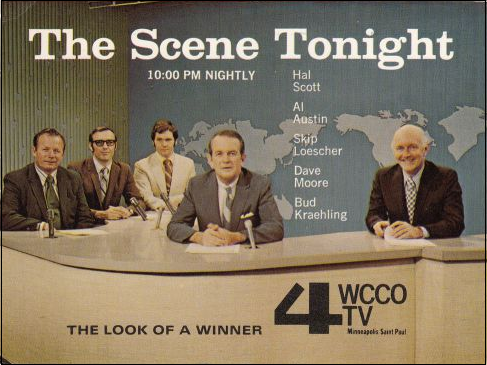 Another feature of Scene was "Action News," in which the station's investigative reporter, Skip Loescher,* would find out the story behind stories about which viewers wrote in. Some of the stories, such as the one tonight, were fairly light; others were serious news stories with major consequences. *Hilariously satirized here in Channel 11's Lunch With Casey as "Skip Tomalou." Hal Scott wrapped things up with the sports, and in this pre-internet, pre-cable era, the main focus of the sports was the scoreboard, presented lovingly through typewritten scores that were then scrolled through in front of the camera. If you've watched the video, you know what I mean. Of all these things, thought, what most struck me was how unobtrusive the commercials were. Most of them were without music, and when it was used it wasn't the loud music that today's commercials often feature. As a matter of fact, there was a sensibility about most of the commercials on Scene, as if it was understood they'd be viewed by people who might be in bed, and were designed not to disturb them. There's at least one other Scene Tonight video out there, and I'll go through that some day. But in the meantime I found this absolutely fascinating. Watching it, all of a sudden I was eight years old again, back in the double-bungalow on 31st Avenue South in Minneapolis, and the theme music was absolutely the way I'd remembered it all those years ago. It's a precious piece of tape, as all such shows are, not only for what it tells us about the times, but what it tells us about ourselves. Wow, this was a real throwback treat to see! Not everything involved with the presentation and content of a newscast has improved or been for the better.....just watch WCCO or any of the other local channels and you'll see for yourself. Help fill out the TV Guide crossword puzzle! Martin Milner, R.I.P.,Judy Carne, R.I.P.